Lower Carboniferous, Serpukhovian: fig. 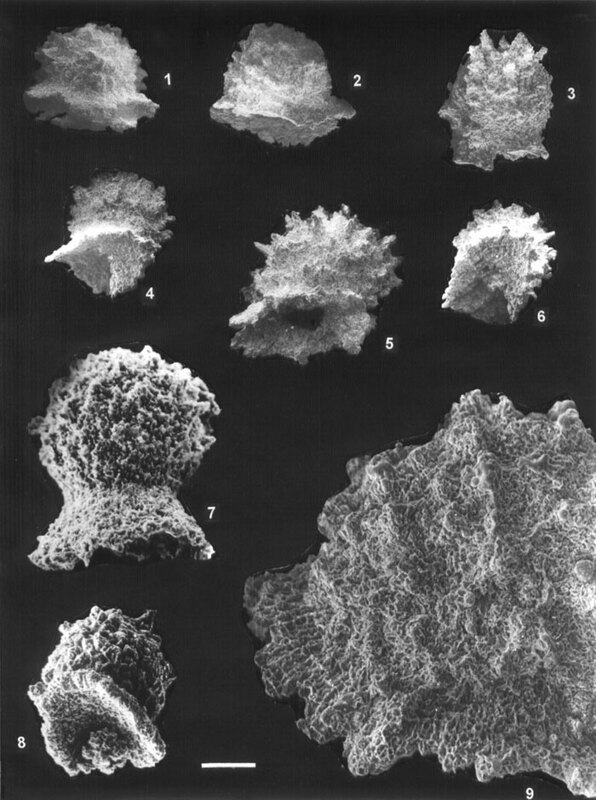 1, 3-6, 7-9; Middle Carboniferous, Lower Bashkirian: fig. 2. Fig. 1, 4-6, 9 - Uzbekistan, Tien Shan, the Ugam River, sample 803/24; fig. 2, 3, 7, 8 - Kazakhstan, Pri-Caspian Dipression, North Dipression Side Zone, Karachaganak Massif: 2 - borehole13, sample 3096 (depth 5109-5116.5 m), 3, 8 - borehole19, sample 112 (depth 4760-4769 m), 7 - borehole33, sample 86913 (depth 4934-4941 m). Fig. 1-9. Caspiaza aculeata Afanasieva: 1 - FF-P229/203-00405 (bar=100µm); 2 - FF-P229/203-00402 (=100µm); 3 - FF-P229/203-00401 (=100µm); 4 - FF-P229/203-00321 (=100µm); 5 - holotype, FF-P229/203-00311 (=100µm); 6 - FF-P229/203-00319 (=100µm); 7 - FF-P229/203-02608 (=100µm); 8 - FF-P229/203-00201 (=100µm); 9 - FF-P229/203-00318 (=25µm).